Here is my Holiday Pavlova. This famous dessert is named after the Russian ballet dancer Anna Pavlova and is considered to be the national dish of Australia and New Zealand. It is naturally gluten free so is an obvious choice for everyone cooking gluten free. Once you master the basic technique for meringue you can make them in varied shape and sizes. They can also be served with any filling, homemade lemon curd is my personal favourite. These variations make meringues a year-round dessert that can be varied with the season. 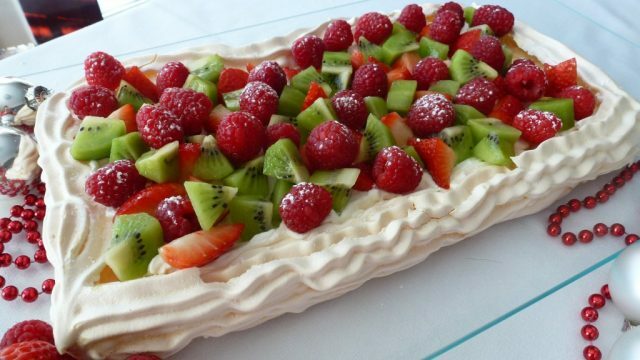 Pavlova is typically a meringue base filled with whipped cream and topped with fresh fruit. For a festive look I topped this Pavlova with a festive combination of red and green fruit. I most often like to serve fruits and vegetables that are in season but during the holidays I can’t resist the red and green theme. I added a dusting of icing sugar for a final touch. A meringue dessert is made from whipped egg whites, sugar (either granulated or icing sugar), an acid (cream of tartar and/or vinegar) and a binding agent (cornstarch or corn flour). When baked the meringue develops a crisp crust with a soft, light inside. Meringue is easy to make but there are a few tips you should know. Follow these and you will make a successful meringue the first time you try it! -any yolk, even a tiny fleck, will affect the ability of the egg white to increase in volume. If you have a bit of yolk in with the whites remove it with the egg shell half. Since this dessert is naturally gluten free it seems like a good dessert to have in your repertoire. Have you tried to make pavlova? Tell me in the comments below your pavlova story. Cover baking pan with parchment paper. Using a pencil draw a circle, square or rectangle on the paper to make a meringue that will fit the serving dish you choose. Flip the paper over so the pencil is on the underside. Beat egg whites, salt and cream of tartar together in a bowl until the whites hold stiff peaks. Add sugar, a few tablespoons at a time, beating until mixture is stiff and glossy. Beat in the cornstarch then the vinegar. Spread meringue mixture onto the shape you have drawn to make a base. Fill piping bag or zipper bag with some of the meringue mixture and pipe an edge all around the base. Repeat to get the height you desire refilling the piping bag as needed. Pipe any remaining meringue into small shapes and bake with larger meringue base. Bake in preheated oven for 60-65 minutes or until meringue is firm and slightly browned. Turn off oven and allow to cool completely in the oven with the door ajar. In electric mixer whip cream to soft peaks. Add vanilla and beat until stiff. Just before serving fill the meringue with whipped cream. Top with fruit of your choice. Dust with icing sugar if desired and serve.